Ingersoll Rand Air Compressor Repair & We Service All Major Brands! 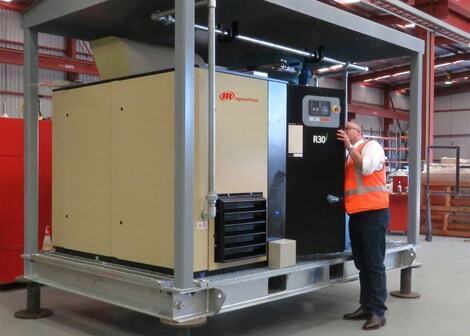 As one of the largest Ingersoll Rand air compressor repair, installation, and service providers in Northern California and Nevada, Cisco Air Systems specialize in industrial air compressors for businesses like yours. We offer compressors from high quality manufacturers like Ingersoll Rand, custom installations, equipment service and maintenance, and on-site repairs. We also provide rentals, air system audits, and parts, accessories, and lubricants from all the major brands. Call us today at (888) 491-4011 to speak with one of our certified technicians. Our customers rely on Cisco Air Systems for a steady supply of compressed air. Ranging from manufacturers to repair facilities to municipalities to medical facilities, our customer base is broad and diverse, but all have one thing in common: compressed air is essential to their business. That’s why we consider any problem that our customers experience an urgent issue, and always react accordingly. We can repair and overhaul all major brands either at your site or in our shop. Our goal is to avoid unnecessary downtime by returning your equipment to working order as quickly as possible. When conducting service visits, our professional technicians travel to your site and inspect the equipment, diagnose and explain the problem, and provide options for rectifying the situation. We carry repair parts in our service vehicles to speed up repairs, and always aim to fix your issue with just one service call. Customers also have the option to drop off equipment for repairs at our shop. And if it turns out that you need a replacement unit, we can walk you through the process of choosing a new compressor. Selecting the correct compressor for your needs is crucial to your business’ efficiency and longevity. Our specialized engineering professionals understand the needs of your industry, and can provide a summary of the pros and cons of the various rotary screw, reciprocating, and rotary vane models we carry. Whether you work in pharmaceuticals or food and beverage and need a solution that offers air purity, or in manufacturing or another industry where complete gas and containment are not necessary, we are ready to develop a tailored plan to ensure you always have the compressed air you need. And should you require any additional parts or accessories, we maintain a large inventory on site, stocked with the leading brands. We also offer a rental fleet of equipment for all of your short-term and long-term needs. Having provided services on the West Coast since 1973, we have developed strong relationships with our customers. They trust our expertise in selecting and designing customized systems, our comprehensive maintenance programs that minimize downtime, and our quick response to systems needing service or repairs. Many of our customers have worked with Cisco for 10 years or more! Call (888) 491-4011 now to learn more about our reliable service and proven expertise.